Many people have their home network setup with a dynamic dns service in order to remote access their files, printers, or Pi based security camera systems. Many people also suffer from less than stellar internet connectivity and find themselves unable to access their home system due to a stalled signal. 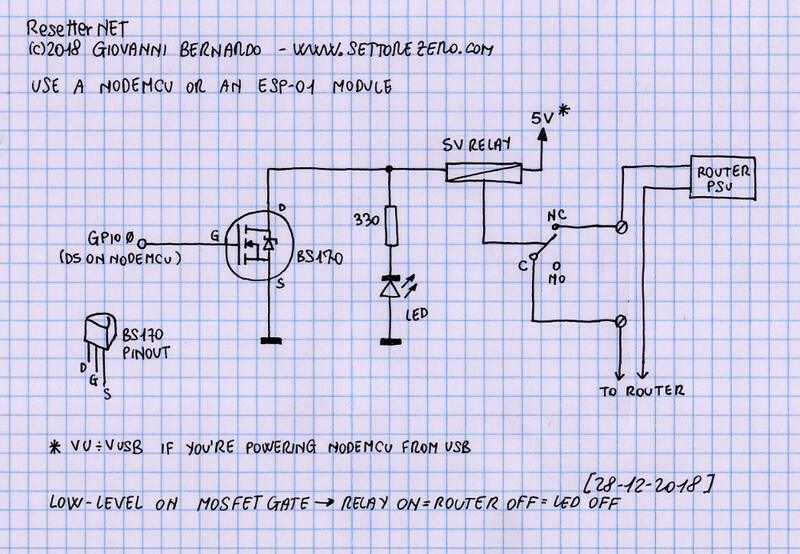 netBOOT is an Arduino based device that automatically resets your modem for you, when you are unable to. Core of the system is a standard issue ATMEGA328p based Arduino board combined with a W5100 Ethernet module, and a relay module. The software on the Arduino periodically pings a list of IP addresses and listens for a response. If none is found within 3 tries the relay module, which is connected inline with the DC power of your modem, is clicked open for 10 seconds and then returned closed. Once your modem has rebooted and re-synced everything should be good to go. We don’t remember seeing this feature in the list of specs for Google’s new OnHub. The ability to reset bad connections seems like a feature that should be built into future-thinking routers, right? We’ve all have had to reset our routers or modems at some point because they were acting up. The typical scenario is; unplug the device, wait 30 seconds, plug it back in and wait for it to boot back up. While not hard, this can be an annoyance, especially if accessing the router or power cord is inconvenient. [Taylor] wrote in to tell us about his wireless router that seems to need to be reset more than he’d like. Although the simplest solution may be to get a new router, he thought it would be fun to do something a little more exciting by making a wireless reset controller. [Taylor] started with an ordinary power strip. He spliced in a relay to the hot side of the AC line, connected to the common and normally-closed pins of the relay. That way, when the relay is not activated, the power strip is powered. Next, a wireless doorbell was re-purposed to act as the transmitter and receiver. The speaker was removed and the output lines connected to a mono-stable 555 timer circuit that [Taylor] made. When the circuit receives a signal from the door bell speaker lines, it will activate the relay for about 30 seconds. Since the relay was wired to supply voltage to the power strip when not activated, activating the relay cuts the power for 30 seconds effectively resetting the router. Now, whenever the router needs a reset, doing so is as easy as pushing the door bell button from anywhere in the house. For the past month, the Raspberry Pi 2 has only been available to the Raspi Foundation, and for about 2 weeks, select members of the media who have worn the Raspi 2 on a necklace like [Flavor Flav] wears a clock. That’s not many people with real, working hardware and when a product is released, the great unwashed masses will find some really, really weird bugs. The first one to crop up is a light-sensitive reset of the Raspberry Pi 2. [PeterO] on the Raspberry Pi forums took a few pictures – with flash – of a running Raspberry Pi 2. It took a little bit of deduction to realize that a camera flash will either reset or turn the Raspi 2 off. Yes, this is weird, and experiments are ongoing. A short video from [Mike Redrobe] confirms the finding and a reddit thread offers an explanation. U16, a small chip located in the power supply part of the Raspi 2, is sensitive to light. Putting enough photons will cause the Pi to shut down or restart. There’s still some research to be done, however, I can confirm a cheap green laser pointer will reset a Raspberry Pi 2 when the beam is directed at the U16 chip. This is the chip that is responsible, and this is not an EMP issue. This is a photon/light issue with the U16 chip. The solution to this bug is to either keep it in a case, or put a tiny amount of electrical tape over the chip. Thanks [Arko] for staying up until an ungodly hour and sending this to me.